NEW YORK – Thursday, Sept 19, 2013 – Today, Network A, a global action sports channel, premiered season four of web series “Every Third Thursday,” with an episode showcasing snowboard manufacturing at the bottom of the ocean. The first episode for the new season from Signal Snowboards continues to test creativity and manufacturing possibility with a snowboard created using only the natural pressure from New Zealand’s Milford Sound. In the premiere episode, Signal Snowboard founder Dave Lee and marketing director Marc Wierenga head to New Zealand to assemble a snowboard on the back of a boat and sink it more than 100 feet into the ocean to test whether the natural pressure is enough to take the place of a pneumatic press. 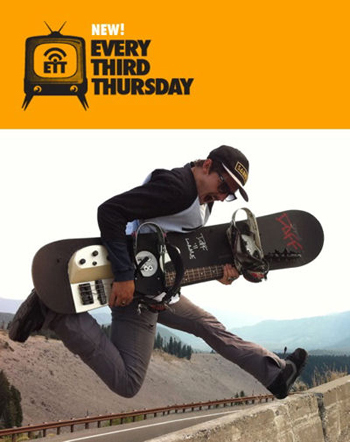 Per the series’ title, “Every Third Thursday” airs monthly on the third Thursday of the month on NetworkA.com. Signal Snowboard’s factory is located in Huntington Beach, CA, where the team of snowboard manufacturers get inventive and create unprecedented concepts of one-of-a-kind snowboards. The team toils with the construction of the snowboard, and finally the board is tested on the mountain. “Every Third Thursday” is produced by Bedrocket Media and Signal Snowboards. Stefan Van Engen and Annie Fast are the executives in charge of production for Network A. Network A, a division of Bedrocket Media, provides the best action sports experience online, anywhere, ever. Network A is the leader in action sports entertainment providing the latest programming for snow, ski, surf, skate, moto, drift and BMX fans. Follow @networka, and visit NetworkA.com for more information.